The News: Well, there isn't any. Still vacant and for lease. See the theatre's listing from the brokers, Bob Riegel and Norm Sauvé of Sauvé Riegel Commercial Real estate. The firm also has a pdf with photos. The property is also listed on Loopnet. Opened: May 6, 1925 as Warner's Egyptian Theatre by by Henry L. Warner, who was no relation to the more famous Warner Bros. The opening attraction was Al Christie's "Stop Flirting." The theatre presented both films and vaudeville. It was constructed as an addition to the previously existing commercial building that became its lobby. Upstairs there was a nursery and the restroom area. Bob Bennett of the Pasadena Museum of History notes that the Pasadena Evening Post of May 5, 1925 described the theatre on page 15. Moving Picture World featured the new theatre in an article titled "Warner's Egyptian Theatre is Architecturally Picturesque" in their issue of July 25, 1925. It's on Internet Archive. They reported that "Temple-like lines, spaciousness, a replica of a golden throne of an Egyptian king, are just a few things that help make Henry Warner's East Pasadena Egyptian Theatre, typical of the architecture of the country from which it derived its name..."
Warner also operated Warner's Photoplay in downtown Pasadena. The area at the time of the opening was known as Lamanda Park. 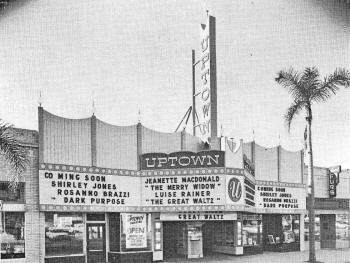 From about 1940 onward the theatre was known as the Uptown Theatre. It closed as the Uptown in 1986. There had been a projected restoration of the building as the Oasis. In 2003 the lobby was filled with antiques and the business was called Oasis Antiques, Art & Design Center. Seating was installed and restoration was begun on many areas of the building. The project came to a sad end as a result of disputes between the landlord and the tenant. Architect: The architect was Kenneth A. Gordon, who also designed Bard's Glen. He was evidently a principal of the firm J.H. Woodworth and Son. Seating: 900 seats, all on one level. Status: Closed awaiting its next act. More information: See the Cinema Treasures page on the Uptown includes some nice research by Joe Vogel. See the Cinema Tour page on the Uptown for lots of photos by Ken Roe. Silent Era Theaters has a page on the building. Don't miss the two 2013 Hometown Pasadena articles on Warner's Egyptian by Sheryl Peters of the Pasadena Museum of History: "Mrs. Feynes and the Movies Part 3" and Part 4: "The Egyptian Becomes the Uptown." Another theatre in Pasadena that had an Egyptian theme (originally anyway) was the Bard's Colorado, later known as the Academy. is the flyspace for the asbestos curtain. "Are These Our Children" as the bottom half of the bill. equipment and a 42 foot screen. See the Script To DVD section "70mm in Los Angeles"
2011 article "Ghost Theatres of Colorado Blvd. - Part 1 of 2"
from the Pasadena Star News. "Mrs. Feynes and the Movies: Warner's Egyptian Theatre." grandfather was manager in the late 20s and early 30s. "The Cheat" with Tallulah Bankhead. A wider view appears from Bill Gabel on Cinema Teasures. leveled to the existing roof line." The theatre has been vacant and for lease for years. below come from the firm's Warner Egyptian pdf. The stripped out lobby as we look in from the street. A look toward the stage. Needs a bit of work. Another look toward the back of the house. A peek into the lobby of the Uptown. direct you to a full size version on the website hosting it. question concerning reproduction or other use. The Cinema Tour page on the Uptown has many great photos. Here we're looking at a 2003 rear auditorium view by Ken Roe. A proscenium detail by Ken Roe. view is the 1925 fire curtain with painted advertisements. running "The Shady Lady" plus vaudeville acts. It's a photo by Harold A. Parker. is running "Saturday's Children," a 1929 release. can pan around to explore details. "Warner's Egyptian Theatre is Architecturally Picturesque"
in their issue of July 25, 1925. It's on Internet Archive. A look at the proscenium. The rear of the auditorium. page. It's a photo from the Kneisel Family Archives. he worked across the street from the theatre. on the SoCal Historic Architecture page.